It’s week nine! That means this is the first of four weeks of 5k pace intervals for speedwork, and the last week of training to consist of four days of running (well, if I had actually run four days this week). Every week after this will have a bonus goal pace run smushed between my easy three on Tuesday and my speedwork on Thursday for a total of five runs per week until race week (when the goal pace run gets cut out again). That must mean we are getting closer! Despite what I said last week, I made it out to run with the Mt. Juliet group again this week. It was nearly 80 degrees outside (yeah, let that sink in since I was running in the snow less than a week prior) and daylight savings meant the sun was still out. I love spring! No more treadmills for me (until the thunderstorms show up). They are a super convenient group to run with because I can take my time getting home after work since they don’t start till 6:30pm, and they usually run 3-4 miles. Perfection for Tuesdays. A lot easier than my Wednesday/Thursday group who start at 6pm and are in the complete opposite direction from my house, so I have to change clothes at work. Anyway, I ran with the same two ladies doing 3:1 intervals. I actually had my Garmin with me, but failed to turn the GPS on. *facepalm* We ended up doing a little over 4 miles in under 50 minutes. Nice and easy, but my legs were still tired from Sunday’s tempo run! They were sore and heavy the next day, which is unusual after a Tuesday run. Then I hit the stop button on my watch instead of the lap button and didn’t realize it for 0.6 mile, so my first recovery interval looks short and my map looks like I cut across the field. I calmed after that. 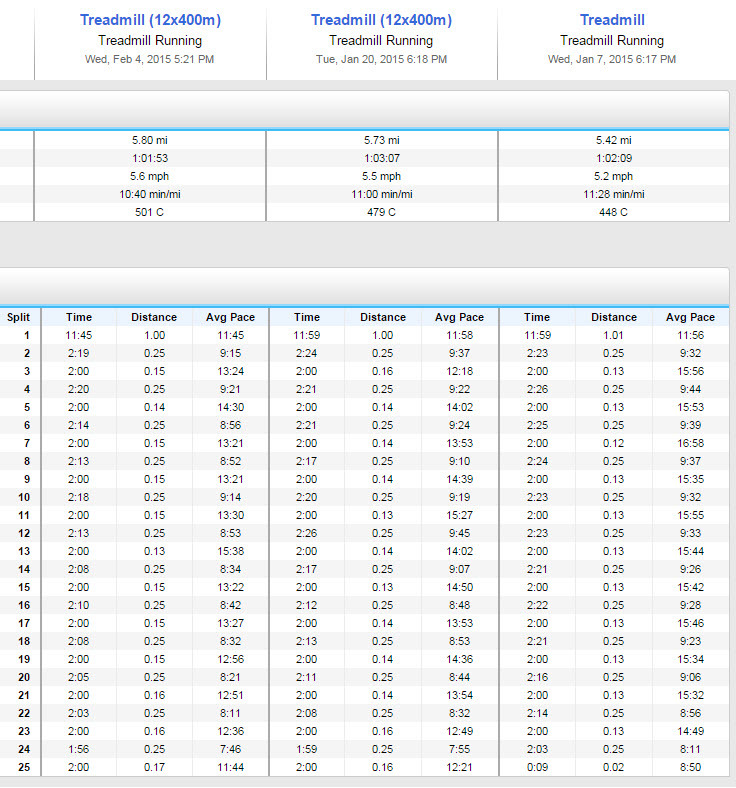 The next four intervals were all done within my 5k pace. My times were 5:11, 5:11, 5:05, and 5:02. On the last one, I pushed it, hoping for my fastest and came up with 4:40. Six seconds slower than my first one, but not too shabby! That’s still about a 9:30 min/mi pace! And I did jog (no walking!) all of my recovery intervals. I actually ran them faster than I meant to, with the fastest one being “jogged” at an 11:45 min/mi pace. Yeah, that’s faster than I run my easy runs. One of my running-with-groups fears came true though: I was the last to finish. To be fair, I only had about a lap further than the next to last person, and a few people said they cut theirs short and only did five intervals. So I can be proud that I completed all six, even if everyone did have to wait on me. Woohoo, race day! I love race days. Especially those where the race doesn’t start until 10:30am. Take that, 3am Disney wake up call. I had decided that I was going to put in my 11 miles on Saturday, instead of Sunday. This mainly had to do with the fact that there was a 70% chance of rain all day Sunday, and I would rather do five miles in that rather than 11. Yeah, it would probably be better to do the miles all at once, but I still have three +/- 13 mile runs in the next three weeks. Plus it’s not like there were hours between the miles. Just a couple 30 min breaks or so. The first of these miles was a warmup mile in the half hour before the race started, which was an easy peasy 13:30 mile. The next three were the race itself. I’ll have the full race report up soon, but I’ll just say, for now, that, yes, I PRed, and I PRed big. Speedwork works, people. I then attempted to finish off the remaining seven on the downtown greenway following the race. This didn’t really happen. First of all, I ran the race way harder than I had originally planned on (hence the PR). Second, I ate lunch after the race and then attempted to go run immediately afterwards. This is a Bad Idea. I started off okay, figuring I’d take walk breaks every 4-5 minutes or so. My legs were still trying to be kind of speedy, so I ended up doing the first mile in 11:46, despite the walk breaks and trying to be slower. It all really went downhill from there. My walk breaks shortened to every 3 minutes. Then every 2. By three miles in, I was needing a walk break every 30 seconds. I can only imagine this is what hitting the wall in a marathon feels like. My legs would just not run. On top of that, I was having mad stomach cramping from not waiting to run after eating. 3.2 miles in, I called it quits. Unfortunately, I was doing an out and back route, which meant I had to walk 3 miles back, and the cramping never let up. In fact, a shower, a nap, and a Predators game later, I could still feel the cramping. Not a good run. But I couldn’t be too upset about it, considering I just had a major PR. You can probably imagine that after six miles of 5k pace running over the past few days plus an additional however many easy miles that my legs would be shot. And you’d be right. They actually weren’t terribly sore, but I wasn’t really in the mood to do a long run, especially not one in 40 degree rain. So I ended up taking a rest day. I don’t feel too guilty about it, since I had two quality speed days this week. Next week can be more about the mileage.